It took me all summer to get around to making zucchini bread. I don’t have a go-to recipe, and I wasn’t feeling inspired. I didn’t want spices. I didn’t want nuts. I didn’t want chocolate. I wanted this, although I didn’t know it yet. Butter, infused with basil and mint, so flavorful and delicious that I almost canned the baking idea in favor of just tossing that butter with shredded zucchini. (I’ll be doing that too, you can be sure.) The subtle tang of rye. A little sugar, but not so much that you couldn’t still slather a slice in raspberry jam. And we have. Oh, we have. 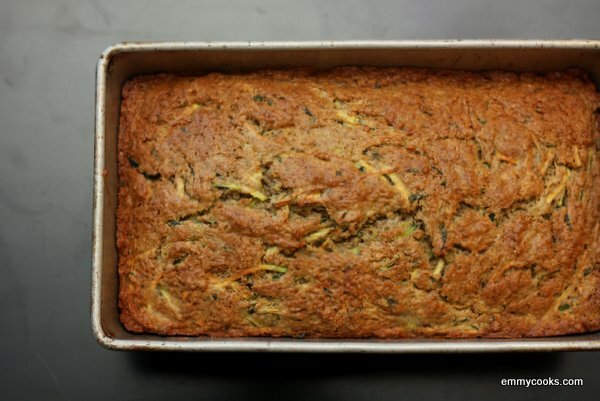 Zucchini Bread with Rye, Basil, and Mint (adapted from Good to the Grain): Chop up 2 Tbsp. basil leaves and 1 Tbsp. mint leaves and mix them into 4 oz. (1 stick) melted butter. Set aside to infuse. Resist eating. Combine 1 c. rye flour, 1 c. all-purpose flour, 1/4 c. wheat germ, 1/2 c. sugar, 1 1/2 tsp. baking powder, 1/2 tsp. baking soda, and 1/2 tsp. kosher salt. Mix well. In a separate large bowl, coarsely grate 1/2 lb. zucchini (about 2 c.) into a large bowl, then whisk in 1/2 c. buttermilk and 2 eggs. Scrape the herby butter into the zucchini and stir well, then add the dry ingredients and stir just enough to combine. Scrape batter inter a buttered loaf pan and smooth the top. Bake 60-70 minutes at 350, rotating the pan once after 30 minutes. The bread should be a deep golden-brown and pass the toothpick test. Cool in pan for 10 minutes, then remove from pan and allow to cool completely on a rack. Try not to devour the entire cake warm; it will be even better (and slice more easily) when completely cool. Store in an airtight container up to three days. This entry was posted in Baking, Breads, Breakfast, Cakes, Desserts, Feeding Kids, Food, Recipes, Snacks and Apps and tagged cooking with herbs, quick bread, summer CSA recipes, zucchini bread, zucchini recipes on August 29, 2012 by emmycooks. Love the rye. Never would have thought of it. Looks great! Love the flavor combination! I don’t usually make any bread but I think I want to try this. I usually find zucchini bread to be too sweet but this savory assortment of ingredients is very intriguing. I skipped over the recipe initially, but after reading your description I have to wonder what on earth I was thinking back then, because it sounds so good! That looks great! I’ve never made this before, but I really would like to now. What a great loaf. Emmy I haven’t gotten around to making zucchini bread either! Just too many yummy things to make on my list. :) Your bread looks divine and I love the addition of the herbs. I like that it’s low sugar. I will try to remake as a gluten free recipe. The combination of mellow flavors sounds divine. This recipe was perfect for the zucchini we got in today’s farm share. We used E&J’s plum jam instead of raspberry and it was delicious.